Blockchain is an emerging technology that has the potential to advance finance literacy. However, there is still much to know about this technology. Centre for Excellence and Financial Inclusion analyst PERCY LARRY gives an overview of what Blockchain means in the Papua New Guinea’s context. Larry: The Blockchain is a new concept which really is a decentralised database that stores a registry of assets and transactions across a peer-to-peer network. The term Blockchain is derived from its structure where blocks (or bundles of information or records) submitted by users are stored in a chronological chain. Every entry into the Blockchain is stored in a cryptographic file and cannot be copied or tampered with by anyone else. It is more or less a public registry of titles and transactions. Larry: Blockchain works on a system of validation and trust and has an interesting property. It operates as a distributed ledger open to everyone and once data is recorded in the Blockchain, it is very difficult for anyone to change it. It provides a way to record and transfer data that is transparent, safe, auditable and resistant to outages. To demonstrate, the first Blockchain called the “genesis block” holds source information or record that is referenced through successive blocks. With the Blockchain, it is very difficult to tamper records which is its selling point. People from all over the world validate available information and any falsified information is easily detected and removed. Information is verified and stored using advanced cryptographic software making it secure. Each block has three components and they all play an important task in protecting data that they store. The three parts that make each block is the Data, Hash, and Hash of the previous Block. A classic example of the Blockchain is Wikipedia. The Wikipedia website is accessible by people from all over the world, however, only its authorised contributors can submit and amend articles in its database. The Blockchain appears in other forms as well like the search engines. One doesn’t need to create his own search engine but can simply log onto Google and even sign up for web mail service (Gmail) with Google. How can the Blockchain benefit Papua New Guinea? Larry: The Blockchain technology can be applied across multiple areas to improve life for many people in Papua New Guinea and the Pacific Region. One for instance is the voting system, whereby tampering will be eliminated resulting in a fair and safe election process. The Blockchain will validate votes by ensuring legitimate votes are cast and counted. Agriculture and medicine are other vital areas that can be effectively managed through the use of the Blockchain. Medical drugs can be traced from the source to the shelf. The entire supply chain for all medication can be tracked online which is vital for all governments, especially in ensuring that their medical supplies are genuine so they can help their citizens. The same can be said for agricultural produce and any other product where consumers feel they are part of the Blockchain network ensuring authentication and quality. Larry: For the Blockchain to be effective, a reliable Internet network is required. However, in Papua New Guinea, the Internet is generally expensive, including devices such as mobile phones and computers. Internet connectivity among the different service providers is good but outages can cause big delays in connectivity for two to three days at times, so engaging an alternate ISP is crucial. 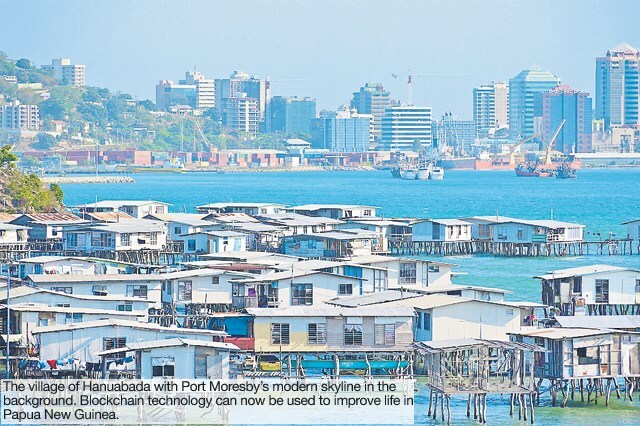 It is anticipated that the Government of PNG will upgrade the Internet highway from Australia which will result in quicker and cheaper Internet service in the country. Literacy is an additional issue that the Government of PNG is addressing through its free education policy in all public schools. In December 2017, the Bank of PMG hosted the first PNG Digital Commerce Association (PNGDCA) gathering. This association will pave the growth of Blockchain Technology in PNG. The PNGDCA will be officially launched in 2018. It currently comprises of over 50 stakeholders from the banking, finance, business and mobile industries. President of the PNGDCA Isikeli Taureka is confident that the Blockchain will revolutionise the process of trading and payments in the country.